This is an exceptional piece from the Arthur Wood & Son factory, manufactured in the 1930s. Redolent of the era which became fascinated with discoveries in Egypt and the designs from China, this Vase captures some of the images relating to this. 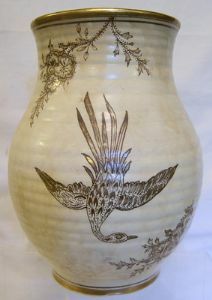 The Vase is an Art Deco style ribbed design with a large handpainted exotic bird set against foliage in a gold colour with varigated browns making up the rest of the picture. There is a golden rim along the top edge and a similar line at the base, both of which are in excellent condition. It is backstamped and shows the number for pattern 3713 dating it to 1934. This vase is in excellent condition. It has no chips/nibbles nor restoration work.